Barbara Aiello at a Bar Mitzva in Serrastretta. Every Monday and Thursday in the 1920s Antonio Aiello dutifully traveled 25 kilometers from his Calabrian hometown of Serrastretta to study the Torah, the Jewish holy book, at the home of a man known as the “Rav,” or rabbi. He often hitched a ride on an artichoke cart, or so he told his daughter Barbara Aiello, who is now a rabbi. The darker side of the story is that no Jews were officially said to reside in Calabria at the time. The Spanish Inquisition and subsequent Roman Catholic persecution had decimated a once-flourishing Jewish community. Jews had been expelled or forced to convert. For a time, so-called “new Christians” held onto their Jewish ways closed doors. Jewish holidays were celebrated secretly. Gradually, the “marranos” — or crypto-Jews — were assimilated into Catholic society, eradicating most traces of Jewish life from southern Italy. Now, signs of a hidden past are emerging. In 1986, archeologists discovered the ruins of a synagogue they speculated was built under the Roman Empire. First signs pointed to a Roman settlement until archeologists found floor mosaic depicting a seven-branched candelabrum, the Jewish menorah. “No one had any idea a Jewish community existed there,” Elio Toaff, the then-chief rabbi of Rome told the New York Times. Both Aiello’s immigrant parents descended from crypto-Jewish families. In Pittsburgh, her grandmother went to the basement to light Shabbat candles. “We’re in America now! There’s religious freedom here!” Antonio told his mother, Aiello’s grandmother. “You never know,” was her solemn rebuttal. Antonio Aiello was a GI in Europe during World War II. He was present at the liberation of the Buchenwald death camp. “Do something for the Jewish people,” he implored his daughter. She became a rabbi. Her career has included an apprenticeship in the Virgin Islands, a seminary in New York City, and a rabbinate in Florida. 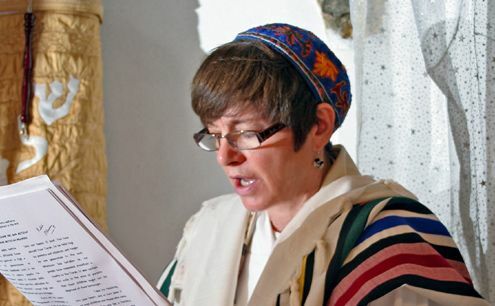 Five years ago she accepted a job at Milan’s Lev Chadash (New Heart) synagogue, making her Italy’s first non-Orthodox rabbi. After the Lev Chadash experience, she decided it was time to make good on her promise to her father. She arrived in Serrastretta two years ago and is known by the locals as “the woman who bought the house” — a house that in fact has been in her family for generations. She bought adjoining units to make space for the synagogue. Gradually, Aiello discovered that Serrastretta is full of Jews. Many are finally ready to start talking about their faith. She spoke to Marc di Martino. You’ve brought what some refer to as “Americanisms” to the Italian Jewish scene. Do you look at yourself as an outsider or as an Italian Jew with a different tradition? The latter: an Italian-American Jew, who, as a rabbi, is above all else a Jew. I work to revive Jewish tradition that is uniquely Italian in a place, Calabria, where many believe Italian Jewish tradition was born. Because I’m an American some can view this as an insurmountable cultural obstacle. But I don’t think so. I was raised with Italian Jewish traditions as well as a “marrano” background, in that my family’s heritage dates back to the time of the Inquisition and forced conversions. This [common] heritage … seems to overcome the other more obvious cultural differences. After two years at in Milan, which has the second largest Jewish population in Italy, you opened a synagogue in Calabria. Not exactly an ideal stomping grounds for a rabbi — let alone an American woman. It was a decision of the heart. My family’s roots are in here. 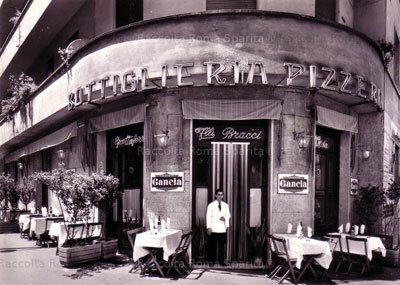 The family escaped from Toledo, Spain to Sicily, and then to the toe of the boot, near Reggio Calabria. From there they traveled north to Nicastro. When things deteriorated they fled to the mountains of Calabria, here in Serrastretta, because the hills offered protection. They were among the “anousim,” or “forced ones” for centuries. You also honor your father’s memory. Do you worry your neighbors might see you as an iconoclast, or think that you’re here to chip away at their accepted values? It’s my responsibility as rabbi to help my neighbors understand why I am here and what I hope to accomplish. If I don’t stand tall and explain myself all sorts of misconceptions can arise. I take the time to speak to as many people as I can, on an individual basis. I tell them about my family and why I am here. I’m helped in this regard by the late Pope John Paul II, who shortly before his death did a wonderful thing for me and for all Jews. He said that the Jews are the older brothers (and sisters) of Christians and that we are linked together by shared traditions. This has been an enormous help. I talk often with the local parish priest, Don Gigi Iuliano. In December, I invited him to the first Chanukah celebration in a Jewish synagogue in Calabria in 500 years. He in turn announced the event to his parishioners, 45 of whom joined us — and all of who spoke about their Jewish roots. This day-to-day, step-by-step footwork makes the difference. I tell people that we Jews do not seek converts, that we’re open to anyone who wants to learn about the religion and connect with us on any level: religious, ethical, cultural, and even gastronomical. I also go to local schools and talk to students in religion classes. I teach songs, discuss traditions, wear my kipah and tallit (yarmulke and prayer shawl) and demonstrate through word and action that I’m part of their community. So far, so good. On your website there’s a list of Italian-Jewish surnames, many of which seem indistinguishable from non-Jewish Italian surnames. How does someone go about determining Jewish-Italian roots? Regarding Italian surnames, forced conversions is a key factor. We’re looking at families that were Jewish first and forced to change religion. We know that the Kingdom of Naples was part of the Spanish empire, and that after Torquemada finished off Jews in Spain and Portugal, the Inquisition reached into Sicily and Calabria. This explains how a family that’s been Catholic or secular for centuries can have Jewish roots. Surnames that indicate names of Italian towns, village or regions are often indications of Jewish roots — for example, Calabrese, Catanzaro, Cosenza, and my mother’s surname Siciliano. Centuries ago, Jews without surnames took the name of their area as a way of subtly identifying themselves one to another. The names of things, fiore, tromba, parucca (flower, trumpet, wig) also were adopted by Jews as surnames, once again to help with identification. You can also look to surnames that are Italian translations of Hebrew words: “Sacerdoti,” “Sermoneta,” “Beniamino,” “Buonomo,” “Bonamo” are the Hebrew “Kohane” or “Kohanim,” “Dvar,” “Benjamin,” and “Tzadik.” Names begin with a suffix Di, D’, La, Lo indicates Son of, or in Hebrew, “Ben.” These are the obvious indications historians have been aware of for sometime. It has been observed that the name “Italia” might have a Hebrew origin. Has Serrastretta surprised you? Have anecdotes emerged? I befriended a lovely older woman, Maria, whose dementia was progressing. When she passed away her son invited me to their home. I was astounded. A number of low chairs for the mourners were placed in a circle. The mirrors were covered in black. A small candle burned on the table where a plate of boiled eggs was arranged in bite-size pieces. I recognized these as Jewish mourning traditions. I asked the son about them. He said these were family, not church traditions. He told me that by those traditions the chairs would remain arranged that way for one week (shiva) and that there would be a special meal in his mother’s honor on the 30th day after her death (sheloshim). When I suggested that the family, called Paletta, might be Jews, the son said he assumed so but that they never talked about it openly “I think my parents were afraid,” he told me. I was touched and thrilled by the experience. Why do Italian Jews seem uninterested in probing “marrano” life? I don’t think it’s lack of interest. It has more to do with family and community pressures. Every major Calabrian historian has ignored the Jewish presence. Possibly because historical studies were funded by the Catholic Church, which didn’t want to acknowledge the role that it played in the persecuting Jews. Or it could be that with the “success” of the Inquisition — that is, when Jewish communities were wiped out completely and Jews either fled or converted — historians believed that Judaism itself had also been eliminated. How does a sibling who’s discovered the possibility of a Jewish past deal with the family issues that might provoke? My second cousin doesn’t want to hear about our Jewish past or want it discussed in her presence. It threatens her long-held veneration of Padre Pio. Others have told me that parents and grandparents don’t want to discuss Jewish heritage because Catholic belief and practice might be shaken to its foundations if a family’s history were made public. I know a priest who has strong identifiable Jewish roots. He’s told me that if he had known years ago, he would have studied Judaism and maybe become a rabbi. Now he says he doesn’t even want to think about it. Then there’s my colleague Rabbi Francesco Tamburello, an ordained priest who discovered his Jewish roots, converted, and is now an ordained and practicing rabbi … much to the chagrin of many in his extended family. When will you consider your work to have been a success? My work is a success because I am in Calabria, making Shabbat each week in a real synagogue. We’ve had the first Jewish wedding and the first Bar Mitzvah in 500 years. At those events my eyes have welled up knowing Calabrian Jews have come home. That’s success. Success for me is defined by the journey itself.